The TPP has risen from modest origins as an FTA among Brunei, Chile, New Zealand, and Singapore to become the centerpiece of US trade strategy in the Asia-Pacific. It is breathtaking in its ambition to be a “truly 21st century trade agreement” that covers virtually every factor affecting cross-border trade in goods and services as well as investment among its (current) twelve members. Its twenty-nine chapters seek to reduce barriers, facilitate trade, reinforce regional supply chains, and impose state-of-the-art enforcement mechanisms. If ambitions are met, it will not only reduce barriers to trade and investment, but also deeply penetrate participants’ economic and regulatory structures. In this opening article for Topics of the Month, I narrow the focus to the United States and Japan, which are TPP’s biggest economies and whose cooperation is most essential to success, laying out their interests and their differing levels of urgency. I welcome rejoinders in the next few months that take a different perspective from the one I present. TPP is huge in scope and varied in membership. There are many ways to approach it analytically—as a template for future regional or global agreements, in terms of its effects on individual members or regional supply chains, or even as a containment strategy versus China. Moreover, it is an ongoing negotiation and there are still many opportunities for gridlock: Vietnam could balk at demands regarding state-owned enterprises or labor, New Zealand could reject US proposals regarding pharmaceuticals, Australia and the United States could be unable to come to an agreement on investor-state dispute resolution, etc. Here, I approach it as a comprehensive US-Japan FTA. These two states will see the largest absolute gains in trade, investment, and income if TPP is successful; moreover, their markets are so important to other participants that if they are willing to provide preferential access then, in the end, the others will almost certainly accept painful compromises on other issues. While negotiations did not start this way, they have turned unexpectedly into a test of whether these two long-time trade antagonists can agree on new rules to govern, and deepen, integration. Looking at TPP as a US-Japan FTA allows us to strip the confusion and contention of ongoing negotiations down to a few political-economic essentials. What are the prospects for agreement? What would be its effects on economic structure? What are the prospects for ratification? In this article, I argue that coming to agreement is far more important to Japan than it is to the United States, and that therefore Japan will be much more forthcoming (and the United States potentially less so) than is commonly assumed. I mostly focus on TPP in isolation from the ASEAN+6’s Regional Comprehensive Economic Partnership (RCEP), but I briefly address RCEP’s relevance to the US-Japan dynamic in the conclusion. The ambit of trade law has expanded considerably since the early 1990s, as an almost exclusive focus on goods trade (albeit with significant carve-outs regarding agricultural products and textiles) gave way to a broader agenda. The 1990s saw the creation under the WTO of the General Agreement on Trade in Services (GATS), the Agreement on Trade-Related Aspects of Intellectual Property Rights (TRIPS), and the Agreement on Trade-Related Investment Measures (TRIMS), as well as the voluntary, plurilateral ITA and Agreement on Government Procurement (GPA). Bilateral and regional FTAs have further expanded the scope of what is considered “trade-related.” FTAs, especially involving developed countries, have increasingly focused on non-traditional (or WTO-plus) issues like investment, competition policy, capacity-building, and labor. Leaving aside the sui generis example of the EU’s internal market, the United States has been at the forefront in promoting an assertive agenda of comprehensive FTAs, with recent agreements extending FTA legal jurisdiction into financial services, environment, and labor. TPP participants famously (perhaps annoyingly) speak of it as a “21st century agreement.” Broadly speaking, the “21st century” issues are ones that reach behind borders, unlike traditional trade law, which focused on issues related to entry of goods. Certainly, even 20th century issues could go beyond classic border measures such as tariffs and quotas, as non-tariff barriers and trade-related investment measures would often reflect deeper aspects of regulatory, competition, or industrial policies. But the 21st century issues are undeniably intrusive—e.g. the US-Australia FTA ended up requiring Australia to change its copyright laws to meet a US rather than global standard, while the US Congress would not ratify the US-Colombia FTA until Colombia had changed both its legal regime and treatment of labor unions. Recent agreements have adopted investor-state dispute (ISD) resolution mechanisms, allowing international arbitration panels to override the judgment of FTA participants’ legislatures and courts in some instances. That includes the Korea-US (KORUS) FTA, considered a key precedent in establishing TPP. Both “20th” and “21st” century issues pose significant challenges for the successful negotiation, ratification, implementation, and enforcement of TPP. “20th century” issues were not resolved simply by the turning of the calendar at the millennium, either globally or regionally. Virtually every state maintains some protection against imports that are considered to be sensitive, whether related to national security, environment, indigenous culture, domestic political or economic aims (e.g., healthcare or economic redistribution), or simply the interests of specific groups. The GATT expectation that bilateral or regional trade agreements between developed economies liberalize “substantially all trade,” has been effectively defined as around 96 percent or more of trade. FTAs involving developing economies are typically much lower (e.g., the ASEAN FTA is around 90%). Given the multitude of tariff lines, these leave considerable room for haggling over 20th century issues. For TPP, 20th century issues loom large. Agriculture and textiles are major bones of contention, but there are also a variety of other sectors in which states are seeking to protect their domestic producers. The inclusion of Japan increases the challenge for negotiators. On the one hand, it is a major food importer with one of the most protected agricultural markets in the world and is seeking to continue to protect producers. It also maintains trade-restricting measures in a variety of other goods and services despite having very low average tariff levels; many of these are being targeted by its TPP partners. On the other hand, it is a major exporter of a number of manufactured goods, including autos and auto parts, and trade partners such as the United States and Malaysia are reluctant to fully eliminate their own tariffs and other restrictions. The 21st century issues are probably even more challenging. Petri et al. characterize, seventeen of the twenty-four functional TPP issues areas as “mostly behind border.”4 Investor protections have been key to North-South FTAs since the late 1990s, as the primary benefit for developed country firms in many cases has been preferential investment opportunities.5 Other “behind the border” issues include regulations such as competition policy (particularly as it pertains to state-owned enterprises), copyright and patent law, e-commerce, and labor. In democratic countries particularly (but also in non-democratic ones such as Vietnam), these rules reflect the balance of power among actors as well as ideas about the appropriate role of government and state-society relations. TPP will force all participants to make significant changes even in settled political compromises. Arguably, the United States is not only the primary driver of the negotiations, but also the major outlier. It has staked out the most ambitious agenda on 21st century issues, taking maximalist positions on intellectual property rights, national treatment for foreign investors, services (including finance, e-commerce, and others), investor-state dispute settlement, competition policy, and regulatory coherence. It is also at US insistence that labor and environment chapters are being negotiated at all, and indications are that US negotiators have been adamant about provisions that could prevent TPP members from using capital controls even for macroprudential purposes.8 It has been somewhat less ambitious on 20th century items—i.e., goods trade. While it has pushed for elimination of tariffs and non-tariff barriers across the vast majority of product lines, it has so far shown little willingness to compromise on certain protected sectors, particularly textiles (rules of origin) and some agricultural products (particularly dairy and sugar). Since Japan has joined the negotiations, US negotiators have also demanded an extended period for eliminating tariffs on autos and auto parts. It is tempting to think of TPP as a US effort to create a new model not only for trade agreements but for economic governance as well. Critics inside and outside the United States see it is an attempt to mold the world to fit the needs of major US corporations.9 Ironically, the main beneficiaries will be US trading partners. According to the estimates by Petri et al., the largest percentage growth in income will accrue to Vietnam, while the bulk of absolute income growth will go to Japan.10 They estimate that annual Japanese GDP will be 2 percent higher than the baseline by 2025, with greater gains if South Korea joins and if TPP and RCEP are combined into a single Free Trade Area of the Asia-Pacific (FTAAP) by that time.11 The longer-term benefits are likely to be higher, as structural shifts lock in comparative advantage. 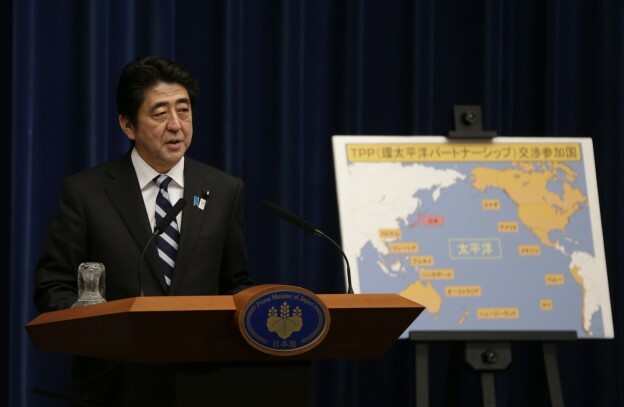 The Abe administration has identified TPP as a key element in the “third arrow” of its growth strategy. On April 2, 2013, Abe characterized the negotiations as a “hundred-year plan for the nation.”12 Abenomics’ third arrow calls for extensive structural reform to transform the Japanese economy into one that is more efficient, market-oriented, and innovative. Some of its targets are quite separate from trade negotiations—e.g., improving female labor participation and increasing labor market flexibility. Others could have been torn from the TPP playbook: increasing the efficiency of Japanese agriculture, reforming provision of medical services, deregulating energy markets, and making financial services more competitive. Abenomics’ structural reform agenda is filled with question marks, not least whether reforms will have the desired effects on growth and innovation. But the more immediate challenge is political. Ambitious structural reform plans have been proposed by any number of Japanese prime ministers, going back at least to the Nakasone-era Rinchō and Maekawa Commission Reports of the 1980s.13 Some have had significant effects, e.g., Rinchō, Hashimoto’s “Six Big Reforms” (including the financial Big Bang and administrative reform), and Koizumi’s reforms in finance, public works spending, and postal services. Nonetheless, the most uncompetitive sectors have remained resistant to structural change, including much of agriculture, textiles and footwear, medical services, and legal services. The reach of state-owned enterprises is also extensive, particularly that of Japan Post, which competes with the private sector in express delivery, banking services, and life insurance. 2. Political structure: Japanese politics is filled with de jure and de facto veto points. For example, Japan has an unusually strong upper house, which can lead to significant dysfunction (nejire kokkai) when the two houses of the Diet are controlled by competing parties. The procedures for passing legislation also lend themselves to gridlock—each legislative year ends with no carryover of legislation to the next, and bills are subject to extensive discussion in ministerial advisory committees, legal drafting in the Cabinet Legislation Bureau, negotiations over question time in Diet committees, and a generally brief legislative session. Ministries are also strong, with their relative power further increased by Diet members’ lack of staff and policymaking capability. 3. Electoral politics: The old LDP structure based on factions and zoku (policy tribes) has weakened with the shift from medium-sized electoral districts with single, non-transferable vote (SNTV) to a mixed electoral system combining single-member districts and proportional representation, as well as stricter political funds laws. Moreover, there is an increasing population of floating voters. Nonetheless, major parties continue to rely on organized groups to bring out the vote, including labor unions for the Democratic Party (DPJ), Soka Gakkai members for Komeito, and an eclectic mix of producer associations, religious groups, and nationalists for the LDP. The political salience of certain producers, such as farmers and small construction firms, has remained high due to the electoral overrepresentation of rural areas, their dependence on state support, and their higher propensity to vote relative to independents. 4. Party politics: The forces that used to hold together the LDP when it held long-term political dominance have weakened.15 Political fundraising occurs primarily at the party and individual levels, reducing the power of factional leaders. Economic malaise, high deficits, and Koizumi’s cuts to public works have reduced opportunities for pork barrel (and thus incentives to remain loyal to parties). Moreover, parties increasingly occupy a narrow and overlapping set of policy spaces. All of these forces reduce the ability of parties to enforce party discipline and increase the likelihood of defections to existing or new parties. These tendencies were reinforced by the tenuous hold of ruling coalitions over the levers of power since 2007. Even small parties or groups of Diet members could exert veto power if they could credibly threaten exit, as seen in the successes of Kamei Shizuka and his five-member People’s New Party in rolling back postal privatization in 2010. As a result of these factors, plus the self-evident problems of economic stagnation and rising debt, Japan became nearly ungovernable between 2007 and Abe’s landslide election in 2012. Each new prime minister had to try to squeeze passage of his cabinet’s policy platform into a scant few months of honeymoon after new appointees settled into their jobs and before his popularity plummeted and power contests began anew within and outside the ruling coalition. Almost all had at least one or two significant victories (including the education basic law for Abe’s first administration, welfare extensions and the creation of the Government Revitalization Unit for Hatoyama Yukio, and the consumption tax hike for Noda). However, large-scale economic reforms proved to take too long and to face too much internal opposition to be pursued by such short-lived administrations. The difficulty of using the legislative process to pursue structural reform helps to explain the enthusiasm for TPP among reformers across political parties, as a way to circumvent their coalitions’ ponderous, veto-ridden policymaking processes. Kan Naoto was the first prime minister to see TPP as a means of breaking political gridlock. In early 2011, he set up a TPP promotion office inside the Cabinet Office with the intention of joining the TPP process in late spring. The March 11 Tohoku earthquake and tsunami put an end to that plan. His successor, Noda Yoshihiko, also voiced support, but was unable to implement the decision, especially as he spent the bulk of his political capital on the consumption tax hike (although the DPJ leadership did withhold support for TPP opponents in the December 2012 Lower House elections). It may seem odd that leaders would see a complex FTA as a way of reducing the influence of sectoral interests. After all, Japan’s trade negotiations have traditionally involved painful, complicated internal negotiations among ministries representing various producer interests. While the Foreign Ministry has putatively been in charge of trade negotiations, in practice the substantive work was farmed out to each of the affected ministries. Some (e.g., the Ministry of Agriculture, Forestry, and Fisheries) have seen their role as defending their constituents against any concessions. Prime ministers and their allies in ministries that represent more competitive sectors have wrested concessions from them only at the last possible moment. Abe appears to have resolved the institutional issues, to the extent that is possible in the context of Japanese politics. Importantly, he has centralized planning and negotiating authority in a newly-established task force (TPP seifu taisaku honbu) headed by his close ally Amari Akira, the powerful Minister of State for Fiscal and Economic Policy, who is also responsible for “economic revitalization” and “total reform of social security and tax.” While the negotiating team members are mostly seconded from ministries, they were chosen by the prime minister’s team rather than by their home ministries, which may reduce the level of internal turf battles, as should Amari’s hands-on management. Abe’s ability to centralize TPP negotiating authority and to make most key appointments on the basis of policy alliances rather than factional or sectoral balance is strengthened by his own personal political power. The LDP owes its large victories in the December 2012 Lower House and July 2013 Upper House elections to Abe’s leadership; plus, there are no feasible rivals at this point. The LDP has until the summer of 2016 before it must face a national election; given Abe’s current popularity and economic successes, even anti-reform backbenchers from rural areas will have to give him the benefit of the doubt as his administration pursues an agreement on TPP. Joining TPP will allow the Abe administration to manage the legislative end of a large portion of his structural reform program in one fell swoop rather than having to deal with endless intra-party negotiations and stalling tactics. It also allows the administration to concentrate on other priorities such as labor market reforms, thus increasing the likelihood of their passage. Abe’s large Diet majorities and solid position within his party suggest that his administration will be able to negotiate with the confidence that an attractive package will be approved by the Diet. Success is contingent on the negotiating stances of Japan’s TPP partners, the length of negotiations, and the ever-present possibility that Abe’s personal popularity will plummet due to political or economic events. But it does appear likely that Japan will accept significant trade- and investment-related reforms of a sort that previous trade agreements—even the Structural Impediments Initiative and the Uruguay Round—never approached. Surprisingly, the United States is probably the biggest wild card in TPP negotiations. As I have argued, Japan is likely to get the biggest boost to trade and growth among the TPP participants, the success of a large portion of Abenomics’ third arrow rests on the successful conclusion of TPP, and Abe’s administration is in a better position to carry through on its trade rhetoric than any Japanese government in memory. Despite symbolic stances, such as those on the five “sanctuary” agricultural products (rice, dairy, wheat, pork and beef, and sugar), as well as popular concerns about forced changes to Japan’s healthcare system and justifiable exasperation with US protectionist measures on autos and auto parts, I expect Japan to accept nearly any deal that falls into the “landing zones” mapped out in the Singapore negotiating round in December 2013. The United States is already the apparent outlier in TPP negotiations in its push for maximalist positions on trade and investment liberalization, on “21st century” issues like intellectual property rights and behavior of state-owned enterprises, on labor and environment issues, and on strict enforcement measures for all provisions. TPA actually calls for even stricter protections and enforcement, and it even demands that trade agreements negotiated under its authority contain provisions to punish currency manipulation. It remains to be seen how flexible USTR negotiators will be in seeking to implement the new instructions, as well as how willing Congress will be to approve an agreement that does not fulfill all of its demands. Many members will understand that not all of their demands will be met and will be willing to vote in favor of a TPP agreement on the basis of how they gauge its overall value. But the TPA fight is emblematic of deep divisions on any number of sectoral and procedural issues, and we should not simply dismiss the restrictive language as posturing. Whether or not USTR can negotiate a TPP agreement that can be approved by Congress, it is playing hardball with Japan on “20th century” issues even though the United States and Japan have highly similar interests regarding most “21st century” ones.20 It has essentially rejected Japan’s position on the five “sanctuary” agricultural products, while insisting on postponing import liberalization on autos and auto parts as long as possible.21 Congressional demands for a currency manipulation provision, meanwhile, appear to be explicitly focused on Japan, even though Japan has not intervened in large quantities in a decade. Japan has a great deal to gain from TPP. Although it is concurrently a member of the RCEP negotiations, which cover approximately the same proportion of its trade, it has prioritized TPP largely because of its greater utility in pushing forward the third arrow (although also for political reasons—see Abe’s April 2013 TPP statement, which states that, “It is very meaningful from the point of view of security that we will be establishing rules with our ally the United States and other countries that share the universal values of freedom, democracy, and rule of law.”) Japan is working against the clock both economically (trying to reinvigorate growth in the face of an aging society and growing fiscal debts) and electorally. A failure of negotiations or even repeated extensions will likely kill the prospects for the success of the third arrow. For the United States, conclusion of TPP is less urgent. The direct economic gains are likely to be small and unevenly distributed, no matter how closely it ends up resembling USTR’s ideal, comprehensive 21st century agreement. Divided government, a drawn-out and weak economic recovery, and increasing skepticism about the benefits of free trade complicate congressional approval, leaving negotiators to tread a razor’s edge between what is acceptable to TPP partners and a congressional majority. The US government is also at least as interested in the TPP’s impact on other trade negotiations, including TTIP, TISA, FTAAP, and eventually a new comprehensive WTO round. This provides incentives to USTR to extend negotiations until the agreement is perfect rather than to settle for a quicker, but still very good, outcome. If this analysis is correct, then Japan is dependent on uncertain US politics for the success of its major policy initiative. It may not even be enough to roll over on all the US demands over agriculture, autos, and currency manipulation. For Japan’s part, I expect full acquiescence with the auto demands and significant acquiescence with agricultural demands (with symbolic victories such as continued protection for polished rice even as rice for animal feed is liberalized). It remains to be seen how US negotiators will deal with currency manipulation, but it seems unlikely that any of the TPP participants will be receptive, making it easier for Japan to resist. There are some grounds for optimism if Washington is thinking strategically. I for one would be happy to see USTR and Congress take seriously the importance of supporting Japan’s economy as it seeks to overcome stagnation. Renewed progress in RCEP negotiations or between China, Japan, and South Korea could also raise US fears of being left out, increasing the relative value of locking in existing gains in TPP. Still, the politics of TPP in isolation do not offer guarantees for a quick resolution. 1. Philippa Dee, “Trade Held Hostage to IP: It’s Anti-Development,” East Asian Bureau of Economic Research Newsletter, December 2013, http://www.eaber.org/sites/default/files/newsletters/EABER%20SABER%20Newsletter%20December%202013.pdf (accessed January 15, 2014); and the New Zealand website “It’s Our Future” http://www.itsourfuture.org.nz (accessed January 15, 2014). 2. TPP is an ongoing negotiation subject to an unusually strict secrecy pledge; so it is impossible to be specific about it. However, public statements from parties on opposing sides of issues, as well as unauthorized leaks, show that there are no real secrets about the main parameters of disputes or participants’ negotiating positions. See Barbara Kotschwar, Julia Muir, and Jeffrey J. Schott, Understanding the Trans-Pacific Partnership (Peterson Institute for International Economics, 2013); Peer Petri, Michael Plummer, and Fan Zhai, The Trans-Pacific Partnership and Asia-Pacific Integration: A Quantitative Assessment (Peterson Institute for International Economics, 2012); C.L. Lim, Deborah K. Elms, and Patrick Low, eds., The Trans-Pacific Partnership A Quest for a Twenty-first Century Trade Agreement (Cambridge: Cambridge University Press, 2012); and Ian F. Fergusson, William H. Cooper, Remy Jurenas, and Brock R. Williams, “The Trans-Pacific Partnership Negotiations and Issues for Congress,” Congressional Research Service, R42694, August 21, 2013. 3. Ian F. Fergusson, et al., “The Trans-Pacific Partnership Negotiations…,” 27. 4. Peter Petri, et al., The Trans-Pacific Partnership…, Table 2.2. 5. Mark S. Manger, Investing in Protection The Politics of Preferential Trade Agreements between North and South (Cambridge: Cambridge University Press, 2009). 6. Peter Petri, et al., The Trans-Pacific Partnership. 7. Peter Petri, et al., The Trans-Pacific Partnership, (Kindle Locations 517-523). 8. Leaked documents support this assessment. One memo summarizes bargaining positions following the Salt Lake City round of negotiations (November, 19-24, 2013), http://big.assets.huffingtonpost.com/1294_001.pdf. A further memo maps country positions on gridlocked issues: http://big.assets.huffingtonpost.com/1296_001.pdf. The intellectual property rights chapter (leaked to Wikileaks in early November 2013) can be found at: https://wikileaks.org/tpp/. On the implications of investment chapter language for the use of macroprudential capital controls, see Kevin P. Gallagher, Sarah Anderson, and Annamaria Viterbo, “Capital Flow Management and the Trans-Pacific Partnership Agreement,” G-24 Policy Brief, no. 79, October 2013, http://www.g24.org/Publications/PolicyBriefs/pbn79.html (accessed January 15, 2014). 10. Peter Petri, et al., The Trans-Pacific Partnership; and Peter A. Petri, Michael G. Plummer and Fan Zhai, “Adding Japan and Korea to the TPP” (Peterson Institute for International Economics, 2013). 11. The effects would be similar for South Korea, whose economic structure and market access issues resemble Japan’s, should it enter the agreement. This appears quite likely—see “Park Seeks Trade Deals From US-Led TPP to China Bilateral Pact,” Bloomberg News, January 11, 2014. 12. http://www.kantei.go.jp/jp/headline/tpp2013.html (accessed January 15, 2014). 13. Edward Lincoln, Japan: Facing Economic Maturity (Washington, DC: Brookings Institution, 1988), 116-126. 14. Steven K. Vogel, “When Interests Are Not Preferences: The Cautionary Tale of Japanese Consumers,” Comparative Politics 31, no. 2 (January 1999):187- 207; Steven K. Vogel, Japan Remodeled: How Government and Industry Are Reforming Japanese Capitalism (Ithaca, NY: Cornell University Press, 2006). 15. T.J. Pempel, Regime Shift: Comparative Dynamics of the Japanese Political Economy (Ithaca, NY: Cornell University Press, 1998); Ethan Scheiner, Democracy without Competition in Japan: Opposition Failure in a One-Party Dominant State (Cambridge: Cambridge University Press, 2005); Ellis Krauss and Robert Pekkanen, The Rise and Fall of Japan’s LDP: Political Party Organizations as Historical Institutions (Ithaca, NY: Cornell University Press 2010). 16. Nihon no shoku to kurashi, inochi o mamoru nettowaaku, “Kangaete miyo! TPP no koto,” http://www.think-tpp.jp/life/index.html (accessed January 15, 2014). 17. Doctors Without Borders Japan, “TPP: Kosho kasoku no mae ni hitobito no seimeisen o obiyakasu joko no kyozetsu o,” December 6, 2013; LaborNet, “‘Kurashi, eigyo, koyo mamore! 3.13 dai kodo e no sando, sanka o utaemasu,” January 10, 2014, http://www.labornetjp.org/news/2014/1389344421050staff01 (accessed January 15, 2014). 18. “Overview of the Bipartisan Congressional Trade Priorities Act of 2014,” January 9, 2014, http://www.finance.senate.gov/imo/media/doc/TPA%20One%20Pager.pdf (accessed January 15, 2014). 19. Press Release: “Levin Statement on Today’s Introduction of Trade Promotion Authority Legislation,” January 9, 2014, http://levin.house.gov/press-release/levin-statement-today’s-introduction-trade-promotion-authority-legislation (accessed January 15, 2014). 20. “TPP saishu kobo: Yuzuranu Bei, amari-shi gosan,” Asahi shimbun, January 15, 2014, 9. 21. Even Senator Rob Portman, a former USTR and generally a staunch defender of free trade, is pushing hard on the Japanese auto industry and for enforceable “currency manipulation” rules targeted at least partly at Japan. See his joint press release with leading protectionist Senator Sherrod Brown: “Portman, Brown Stand Up for Ohio Auto Workers And Push Strong Currency Manipulation Protections In Trade Negotiations,” September 24, 2013, http://www.portman.senate.gov/public/index.cfm/2013/9/portman-brown-stand-up-for-ohio-auto-workers-and-push-strong-currency-manipulation-protections-in-trade-negotiations (accessed January 15, 2014). William Grimes’ treatment of the TPP offers masterful coverage of a host of political economy issues surrounding the potentially stimulative role that TPP could play in boosting the combined fortunes of both Prime Minister Abe and Japan’s economy more broadly. Without challenging his overarching arguments I would like to raise three points that I believe deserve greater attention in any analysis of TPP and Japan. First, it is important to recognize that a central justification given by the Abe government for Japan’s participation in TPP negotiations is its potential contribution to the third arrow of “Abenomics,” namely “structural reform.” Abe and most of his business supporters have treated TPP as a convenient cudgel with which to tame the numerous vested interests in Japan that over the last twenty years have impeded moves toward greater national economic efficiency. In light of that history it is tempting to treat TPP as the silver bullet that will finally slay such resilient opponents and eliminate their ability to resist the benefits of capitalism’s “creative destruction.” The Abe administration’s own nationalistic behavior since taking office, and its dependence on some of Japan’s most powerful veto players, should give us pause in embracing such optimism. Agriculture may indeed be forced to cede some of its longstanding powers of self-protection, but the Japan Medical Association, the domestic pharmaceutical industry, the cosseted financial and insurance sectors, consumer organizations agitated about genetically modified foods, or health insurance advocates worried about damages to Japan’s excellent health care system, are but a few of those resisting TPP. To assume that Abe and the LDP can overcome such deep opposition, particularly when so much of the LDP’s own electoral strength depends on their loyalty, strikes me as unrealistically apolitical. The “third arrow,” may be easier to launch from the bow of TPP but it may still not fly very far. Second, it is important to recognize that Abe’s enthusiasm for TPP is also deeply rooted in his conviction that it will serve as a new Super Glue for the US-Japan security relationship. The Abe administration’s xenophobia has been evident on a host of issues including whitewashing Japan’s negative behavior during the early 20th century, his controversial calls for constitutional revision, and his deliberately provocative visit to Yasukuni. All of these rest on a perspective that treats China and North Korea as existential security threats and the United States as the big brother that will welcome such blind chauvinism as the necessary price to pay for Japan’s moves toward “collective security,” Futenma relocation, and an enhanced military capacity. But Abe’s actions have shattered a decade of multinational moves toward enhanced economic and security cooperation in East Asia, inflamed tensions with democratic South Korea, as well as erstwhile “enemy” China, and in a curious irony, repulsed numerous top US policymakers frustrated at the apparent disdain for their advice that Abe avoid his unnecessary provocations. Of particular relevance to TPP, US-Japan economic interdependence has been shrinking in the face of enhanced Japanese economic connections to the rest of Asia. However, Abe’s singular focus on improving US-Japan security connections and his heightened appeals to nationalism have led to a termination of negotiations on a trilateral China-Japan-South Korea FTA and prevented Japan from giving serious consideration to the proposed Regional Comprehensive Economic Partnership (RCEP), being advanced by the ASEAN+3. TPP would obviously provide the most substantial economic boon to Japan of these three proposed FTAs, but the other two could be pursued simultaneously with TPP, in the process boosting Japan’s economic significance among key Asian trade partners and reducing worries about Japan as a security-obsessed regional lone wolf. Third, a key American goal in TPP is the reduction in constraints over capital controls among its trade partners. Elimination of such restrictions would be an obvious boon to sophisticated US financial institutions in their efforts to enhance their Asian markets. But Asian governments should be wary of the damage caused by Western “hot money” in the Asian financial crisis (1997-1998) as well as the valuable role that capital controls and government regulations in the financial sector proved to play in East Asia (and Japan) escaping the worst consequences of the global financial crisis. For Asia now to buy into the “casino capitalism” being pushed by the US financial sector could prove to be a long-run liability. It is not clear that the US Congress will give President Obama his desired “fast track” authority seen as necessary to pass TPP. And US delays will clearly buy time for TPP opponents to mobilize on both sides of the Pacific. TPP may eventually be acted on positively by the United States and its East Asian partners, but its potentially negative effects, including on Japan and its regional influence, should not be too quickly dismissed. going on within the secret Trans Pacific Partnership (TPP) negotiations… I wonder how these 12 countries are going to resolve this? No wonder there is so little news about TPP. red lines expressed by other Parties.” Hence the impasse.